The majority of consumers identify themselves as being meat lovers. What this means is that they like their burgers to be made with a nice juicy piece of meat. For a variety of reasons, this has created a challenge that a number of different product managers are trying to solve. Can they change the burger product development definition and create a burger that looks and tastes like the real thing with one important exception: it does not contain any meat? All of this discussion about a so-called meatless burger raises an immediate question: if there is no meat in these burgers, then just exactly what is in there? In one case its pea, soybean and beet molecules. In a different approach, bioengineers are growing muscle tissue from animal cells in steel containers. All of this is great news, but the product managers who are in charge of both approaches still have a fundamental question that they are going to need to be able to answer. The question is if they are going to be able to attract customers beyond the vegetarians and animal-rights activists. If they can, then they’ll have something to add to their product manager resume. The product managers realize that in order to be successful, they are going to have to look beyond the people who have already chosen to eat plant based foods. Instead, they are going to have to see if they can win over the carnivores who really enjoy eating a very good burger. The reason that the meatless burger product managers think that they have a chance in this market is because of what the surveys are telling them. First off, it turns out that consumer have a desire to purchase and consume products that can be shown to be easier on the environment to produce. Additionally, when surveyed 2/3 of consumers said that they would be willing to pay more for so-called “sustainable brands”. This has been borne out by the fact that sales of goods that advertise environmental benefits grew by more than 4% last year while growth was less than 1% for those that did not have such benefits. The challenge when you are the product manager for a meatless burger is to get people to start to try your product. A meatless burger startup has gotten two high-end restaurants to start to serve their product. The restaurants are charging between US$12 – $19 for burgers of varying sizes. The product managers say that they believe that their product will be able to compete with conventional beef once their production ramps up. Right now it costs $20 to create one patty while ground beef sells for $1.62 / pound. One of the biggest challenges meatless burger product managers have is with the branding of their products. One meatless burger company has been able to reach an agreement to have their product sold by Whole Foods Market. Where to place the product has been a big issue. It was initially placed in the freezer. However, when the product was moved to the meat section the company saw its sales rise sharply. Not only do meatless burger product managers have to create a product that tastes like the real thing, but t also has to behave like beef does. What this means is that their meatless burgers have to approximate the sizzle and the char of a real burger. Once you get this taken care of you need to be able to emulate the burger’s varied texture and its tangy flavor. You would think that something like a burger would be safe from any sort of innovation, right? Well, you’d be wrong. It turns out that it’s quite expensive to support the animals and the infrastructure that is required to create that burger and so based on their product manager job description, product managers believe that there might be an opportunity for some form of a meatless burger to be successful. Meatless burgers are made in one of two different ways. The first way uses plants such as peas and beets to create a simulation of a real burger. 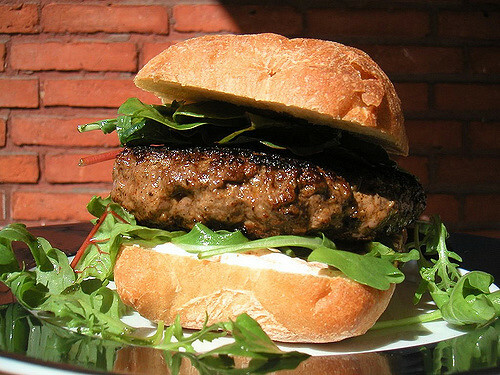 The other uses meat that is grown in the laboratory to create the burger. The key to success in this market will be to create a product that appeals to meat eaters. Surveys of customers reveal that they would be willing to pay more for products that don’t harm the environment. In order to get people to start trying meatless burgers, the product managers have gotten them to be served at high-end restaurants and sold at Whole Foods Market. Now all the product managers have to do is to make sure that their meatless burgers not only taste like real burgers but also act like real burgers do. The time has arrived for meatless burgers. The cost and unsustainability of how we create our burgers today means that the opportunity for a different product is there. The meatless burger product managers just need to find out how to get all of us to give their new product a try! Question For You: What do you think would be the best way to get people to try a meatless burger for the first time? The product managers over at McDonalds have a problem on their hands. Yes, they work for one of the most successful companies in the world. For over 60 years McDonalds has been synonymous with fast food. However, the world is changing and McDonalds is not changing with it. A recent study showed that only one in five millennials, a core market for McDonald’s, had ever tried a Big Mac burger. What’s happening is the company’s flagship product is no longer relevant. What’s a product manager to do?